How to eat bhelpuri with chopsticks | It's a Miracle! Pappu Patligali had never tasted sushi before in India, so many years ago, when Jerry, his American liaison, offered to take him out to lunch at a posh Japanese restaurant, he was a bit hesitant. Since he was the only desi guy in the on-site HQM group, Pappu couldn’t let anyone know about his fears either. Pappu had dreaded having to face chopsticks. At most Asian restaurants, he could ask for a knife and fork and get by, but at some posh restaurants he stuck out like a social outcaste because he didn’t know how to use chopsticks. 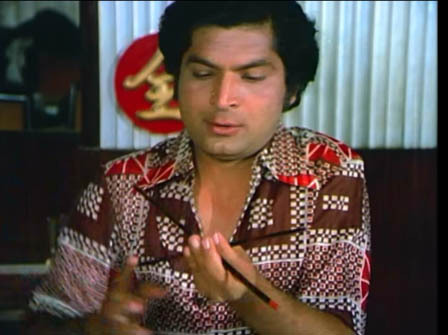 That day at the restaurant, Pappu tried to use the chopsticks. He was successful in picking up a California roll for a fraction of a second before dropping it on the table. The chopsticks fell out of his hands and Jerry and the other team members broke out in a spontaneous paroxysm of laughter. Pappu had never felt more embarrassed in his entire IT career. Growing up in India, Pappu had usually eaten without utensils, only with his washed right hand. His mother had told him that in order to be able to digest rice, he needed to squish it well with the dal, roll it up into bite-size balls, and plop it into his mouth. For chapatis, he often used both hands to tear, but this too was often frowned upon. The only utensil he occasionally came across was the spoon. People not only ate kheer, dahi, and khichdi with a spoon, but also used it to cut omelets into small pieces before putting in their mouths. He saw the fork, but really didn’t have much practice in using it until the training course on Western etiquette in his IT company. The instructor told the engineering trainees that the fork was held in the left hand and that the knife in the right. They were told to practice cutting the make-believe chicken Kiev (which was actually an aloo paratha). Their assignment was to go home and to practice eating all the desi food with a knife and fork for a week. That night Pappu’s roommates ordered chicken tandoori, dal makhani, and naan from the local dhaba. They devoured the food as poor Pappu struggled to peel away the flesh from a single chicken tandoori drumstick. Over time, Pappu learned how to use the knife and fork properly. In the US, he got used to eating an entire entree without touching it with his bare hands or using a spoon. He got very good at shoveling rice and peas with his knife on to his fork, swirling spaghetti, and hen-picking bits and pieces of salad. It took him a while, but he figured out the threshold thickness after which it was suggested etiquette to cut up a sandwich or a pizza with a knife and fork. He didn’t even have switch hands to hold the fork after cutting anymore! But chopsticks were his nemesis. As he reflected on his humiliation at the Japanese restaurant, Pappu vowed that he would learn how to use chopsticks properly. He took home one of the flimsy restaurant variety and practiced. He felt like a young apprentice seeking enlightenment at the Shaolin temple. After weeks of practicing on various cheap carry-out options including on an order of twice-cooked dubious-meat-product that made him violently sick, he became better at it. He even asked for chopsticks for his gra pow and rice at an upscale Thai restaurant (even though he had heard on a travel show that using the fork and the spoon was more common in Thailand). Now, back in India, Pappu relishes every opportunity to show off his precious skill. Be it chicken chili, vegetable Manchurian, or American chop-suey (the recipe does not call for any Americans) – he is always ready. Some days he even eats aloo gobi, poha, and bhelpuri with his shiny, black lacquer-chopsticks. “Choti si Baat” is one of my all-time favorite films too. I was watching it again this afternoon and that song was the catalyst for this post. A little known fact about the film is that it is inspired by the “lifemanship” books of Stephen Potter and follows the storyline of the 1960 English film “School for Scoundrels“. I would argue that “Choti Si Baat” is far better than the original. The protagonist in the original is a sort of Bertie Wooster belonging to the idle English elite. Arun (Amol Palekar) is the middle-class underdog: he is everyman. Arun also has a tinge of “Walter Mitty” in his elaborate daydreams. And then there are the songs. Sigh! Will they ever make movies like this one? Funny and true indeed in many contexts. Seriously! how do they manage chopsticks?? Also, I wish there was someone to revive that basu chatterjee-hrishikesh mukherjee genre. Paushali, I think if we learned using chopsticks at an early enough age, it would have been second nature to us too (like writing with a pen). With practice it is possible to just get by with chopsticks like I do. ha…I am dunce at using chopsticks too….food just flies away whenever I have tried to use them…. I can understand how pappu felt…sigh! I find that I can pick up and eat even very small pieces of food with chopsticks. It is the slippery stuff like seafood that has caused me to get embarrassed a couple of times. As long as using silverware or chopsticks may really help me, I do use them. Otherwise, I don’t hesitate using the ‘washed right hand’. I will let Pappu know. He will be happy. He had a “typical” career-track. Studied in convent schools in India, went to a state engineering college, completed his MS from a small public university in the US, joined an IT firm, and went back to India when his job got outsourced. Strangely, Pappu’s life is almost like a composite of many people I know (including myself). Hi. First time visitor to your blog. Nice post. Pappu could very easily be me! At home we eat with right hand. Using left hand while eating used to get terrible frowns from mom. Over time I learned to use a fork and knife – thanks to my father’s tutoring. Maybe I should write a post about it coz the incident had loads of drama and took place at a railway station’s NVRR! As for chopsticks – I stay away from them. I’d probably gouge out my eye if I tried using them! Yes, please do write about your railway station experience; I would love to read about it! Thanks for stopping by. Pappu would thank you too but he is watching IPL right now. i can only but feel amazed at the dexterity at all those including Pappu for i believe mastering anything that is not your own requires a lot of patience (while one suffers in silence)…interesting post and the clip of Asrani from the film makes me want to run to the video library right now. Patience, indeed. Tough to get a grip (literally). Felt like i was reading about myself…i have struggled with food weapon of any kind barring the spoon…Chopstick must be a nightmare…But yeah, i can showff big time if one knows how to use it 😀 . Not too long ago I used chopsticks for the first time and ever since then have been trying to buy a pair (of chopsticks off course!) and use em whenever I can!! Thanks for reading Nishant. It is an interesting skill to acquire especially for those technically inclined – almost similar to solving a Rubik’s cube (only a bit more useful). Oh yes…Pappu is a character who we all can easily connect to.